Testimonial - Erasermitt - Cleaning whiteboards and blackboards a whole lot faster! "I am very pleased with the Erasermitt. It has been holding up and erasing very well without the spray. I LOVE the magnet feature and it has been working well, too! I really like the way that I can just slide my hand in the mitt, which hangs right there on the board and erase everything so quickly. The size of the mitt is nice, too, because I can cover large sections of the board with just one wipe." 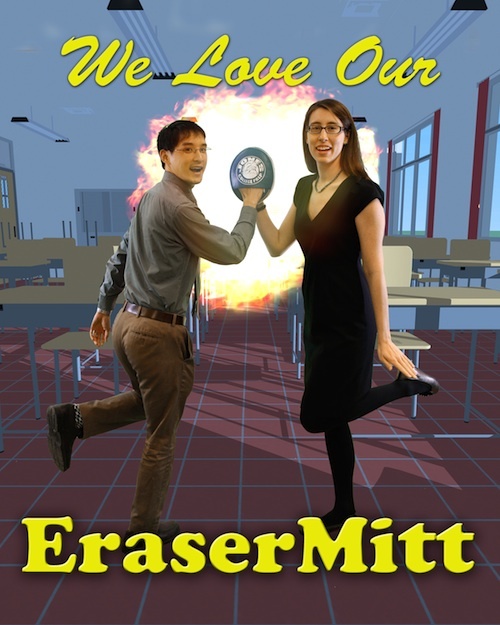 "My staff loves the eraser mitts!" "Wow! My principal ordered the Eraser Mitt as a surprise for the staff. They were handed out today. My class thought it was the most incredible thing they have seen in a while. I normally use crochet rags but your invention worked so well. The construction is well made and having our school's logo on the top made it super special. Thank you for making such a teacher friendly invention.